When I started public speaking in about 1986, I was deathly afraid of public speaking—for one thing, working for the division run by Steve Jobs was hugely intimidating: How could you possibly compete with Steve? It’s taken me twenty years to get comfortable at it. I hope that many of you are are called upon to give speeches—it’s the closest thing to being a professional athlete that many of us will achieve. The purpose of this blog entry is to help you give great speeches. Have something interesting to say. This is 80% of the battle. If you have something interesting to say, then it’s much easier to give a great speech. If you have nothing to say, you should not speak. End of discussion. It’s better to decline the opportunity so that no one knows you don’t have anything to say than it is to make the speech and prove it. Cut the sales pitch. The purpose of most keynotes is to entertain and inform the audience. It is seldom to provide you with an opportunity to pitch your product, service, or company. For example, if you’re invited to speak about the future of digital music, you shouldn’t talk about the latest MP3 player that your company is selling. Focus on entertaining. Many speech coaches will disagree with this, but the goal of a speech is to entertain the audience. If people are entertained, you can slip in a few nuggets of information. But if your speech is deathly dull, no amount of information will make it a great speech. If I had to pick between entertaining and informing an audience, I would pick entertaining—knowing that informing will probably happen too. Understand the audience. If you can prove to your audience in the first five minutes that you understand who they are, you’ve got them for the rest of the speech. All you need to understand is the trends, competition, and key issues that the audience faces. This simply requires consultation with the host organization and a willingness to customize your introductory remarks. This ain’t that hard. Overdress. My father was a politician in Hawaii. He was a very good speaker. When I started speaking he gave me a piece of advice: Never dress beneath the level of the audience. That is, if they’re wearing suits, then you should wear a suit. To underdress is to communicate the following message: “I’m smarter/richer/more powerful than you. I can insult you and not take you serious, and there’s nothing you can do about it.” This is hardly the way to get an audience to like you. Don’t denigrate the competition. If you truly do cut the sales pitch, then this won’t even come up. But just in case, never denigrate the competition because by doing so, you are taking undue advantage of the privilege of giving a speech. You’re not doing the audience a favor. The audience is doing you a favor, so do not stoop so low as to use this opportunity to slander your competition. Tell stories. The best way to relax when giving a speech is to tell stories. Any stories. Stories about your youth. Stories about your kids. Stories about your customers. Stories about things that you read about. When you tell a story, you lose yourself in the storytelling. You’re not “making a speech” anymore. You’re simply having a conversation. Good speakers are good storytellers; great speakers tell stories that support their message. Pre-circulate with the audience. True or false: the audience wants your speech to go well. The answer is True. Audiences don’t want to see you fail—for one thing, why would people want to waste their time listening to you fail? And here’s the way to heighten your audience’s concern for you: circulate with the audience before the speech. Meet people. Talk to them. Let them make contact with you. Especially the ones in the first few rows; then, when you’re on the podium, you’ll see these friendly faces. Your confidence will soar. You will relax. And you will be great. Speak at the start of an event. If you have the choice, get in the beginning part of the agenda. The audience is fresher then. They’re more apt to listen to you, laugh at your jokes, and follow along with your stories. On the third day of a three-day conference, the audience is tired, and all they’re thinking about is going home. It’s hard enough to give a great speech—why increase the challenge by having to lift the audience out of the doldrums? Practice and speak all the time. This is a “duhism,” but nonetheless relevant. My theory is that it takes giving a speech at least twenty times to get decent at it. You can give it nineteen times to your dog if you like, but it takes practice and repetition. There is no shortcut to Carnegie Hall. As Jascha Heifitz said, “If I don’t practice one day, I know it. If I don’t practice two days, my critics know it. If I don’t practice three days, everyone knows it.” Read this article to learn what Steve Jobs does. It’s taken me twenty years to get to this point. I hope it takes you less. Part of the reason why it took me so long is that no one explained the art of giving a speech to me, and I was too dumb to do the research. And now, twenty years later, I love speaking. My goal, every time I get up to the podium, is to get a standing ovation. I don’t succeed very often, but sometimes I do. More importantly, I hope that I’m standing and clapping in the audience of your speech soon. I agree with everything except #1, and #6. About #1, when JFK gave his speech in Berlin, he said, “ech ben ein berlina”, which in German means “i am a doungut”. ein berlina was a dougnut at the time, the correct way to say it is “ech ben berlina”. But he said it very well, so i thinks its more like 20% of what you say, and 80% of how you say it. And about #6, Jobs makes fun of microsoft all the time in his keynotes. Guy, I have been reading your new blog for a few days now – I wonder how you’ll keep up this amazing flow of brilliant content. Excellent bloggers will have stuff like this twice a year, if their readers are lucky. You have it in every post. That is awesome! Great pointers there Guy… thanks for sharing them ! I totally agree with #5, especially in Hawaii where there is a tendency to be more “laid back,” I always made an effort to dress up for my presentations in college. Steve Jobs doesn’t do this, but Steve is Steve. However, I do recall him wearing a suit and tie at a keynote he gave in Japan a few years ago (I think it was 2002…). Anyone know why he dressed up for that one? However, any keynote-type of speech would usually be given for a combination of the first and third reason (mostly third). What about to delivery proceedings before or after the speech? I prefer in every my speech to delivery slide copies or text proceedings only after the speech. When I see that people try to copy the slides contents I inform audience that at the end of the speech an hard copy of the slides will be available or, better, that the slide will be available for download from my web site. about of “standing ovation” or, better, attract attention to biz proposals. There is a myth, an urban legend…or real? Sorry for my English but I suppose the story is understandable. So, Guy, a proposal to add a new BIZ showcase in this blog. http://www.thealarmclock.com that create more people and investors aware of new initiative, but a showcase like this placed here will be more effective. What you think? Great advice. I love how all of these points fall outside the standard public speaking cirriculum. In other words, nothing about speech structure, note cards, faking extemporaneousness. Instead we have the practical matters of business speaking. Lots of stuff I wouldn’t have thought about including the “dress to the level of the audience” and “earn trust of audience” points. Thanks, Guy! Great advice and much needed for most of the keynotes I sit through. The best piece of advice I have gotten about speaking is keep it simple. I was once told, “if you have more than one point, then you don’t have a point.” That’s simple and stick to this as much as possible, except when I delineate into sub points. #3 is dead on, no matter what kind of speech you’re giving. I used to be a teacher. A junior high school teacher. And believe me, it doesn’t matter how good your instructional materials are, and how many degrees you have. If you can’t capture your students’ attention, they’re not going to learn anything. One of the best techniques I found was to ask my audience (class) a question they were sure they could answer, and then tell them the real answer, which was the exact opposite of what they thought. That gives you their attention for a good ten minutes as you explain why the answer is not what they think–longer if you mix in stories related to the subject that entertain the audience as well as further illustrating your point. On your fifth point (Overdress), how this can be compared with what Steve Jobs does? The guy is dressed like if he went out for a pizza at the corner and in the way he stopped to give you a speech! I like his style, but what you are saying here is that Steve Jobs must be dressed with suit because his public (some of them) are dressed with suit too. Great article, I enjoyed every single word of it; if you keep writing like that, I will keep reading them every day. Make sure your the tone of your voice is conversational. Think about the last chat you had with your best friend and talk just like that. For some reason, I used to (and I’ve seen it in others) put on a formal, overly loud voice when public speaking. Imagine having a conversation with each member of the audience. Extending point #8 – try to involve the audience : pose a question or ask for a volunteer. Break down the barrier between speaker and audience. Finally it’s better to be too short than too long. I’m not advocating a 1 minute speech – just make your points short and snappy. Nothing kills a good speech like rambling. Hm, should you really speak to people who can be offended by the way you dress? I suggest joining Toastmasters to improve speaking and leadership skills. I’ve seen amazing results within my club over the last three years since I joined. Great insight Guy. I speak about once a month to various groups that involve different demographics and I have found all of these points to be true. Especially understanding and entertaining them. I also wish there were more people that realized that they didn’t have anything to say. I heard one too mant folk speaking about nothing. And to the guy that asked “should you speak to people that care how you dress.” Your dress should never fog up your message, so whether you like it not, people care how you dress. Dressing in a suit in Hawaii may be true to #5, but loses on #4. A guy in a suit in Hawaii is an outsider. You can still overdress, but you wear an upscale silk Hawaiian shirt instead. Great post! I would add that Toastmasters speaking clubs are an excellent way to improve your presentation skills as well as an opportunity to practice, practice, practice! Toastmasters is also a great way to develop leadership skills and local clubs can be found by visiting www.Toastmasters.org. Can you tell that I’m a member? I was just talking about this yesterday with my parents. Back in high-school and college they taught us very formal and rigid rules of how to give speeches. They never worked for me. Now, after watching a lot of very good and very bad presentations, I can honestly say your advice is dead-on. I would especially hammer home the idea of telling stories. Watch any professional. Comedian, politician, keynoter, etc. The best always tell stories and they do it well. Guy – #5 rang true with me. Last fall, I attended a school alumni/fundraising function in Silicon Valley. Everyone at the event was dressed in business professional attire. The host of the event, a fellow alum and a big Silicon Valley success story, wore topsiders and jeans. He was also had more money than everyone in the room combined. His unspoken message came through loud and clear! rule number 12 must be after 20 years you get to break your own rules. I saw you speak at SVAMA in December and you were both underdressed (in a hawaiian shirt) and gave a sales pitch for filmloop breaking both rules number 2 and 5! Also, you poked fun at Microsoft numerous times… does making fun of your former competition count as breaking rule number 6? That said, it was a great speech and and I seriously doubt anyone wearing a tie in the audience was offended. Lastly, and because you are such a good speaker, why don’t you post your speaking engagements in a calendar on your website? i like everything you said. I remember giving pre-games speeches to my kids before the game and you are right about telling a story. They follow you so much more! good job! Brilliant. Shall distribute it to my Toastmasters club members! It occurs to me that these points are dead-on both for my day job as a trainer and also for my evening alter-ego as a musician. It seems a good performance is a good performance, no matter what it is you’re performing! Very good creative. Thanks for the great job. Author and venture capitalist [Guy Kawasaki->http://en.wikipedia.org/wiki/Guy_Kawasaki] talks about how to conquer the fear of [public speaking->http://blog.guykawasaki.com/2006/01/how_to_get_a_st.html] on his [blog->http://blog.guykawasaki.com]. Guy, I am a minister and also spent seven years on the road as a speaker. It is easy to get caught up in the need to have a standing ovation. That is more about ego than about serving. Not that you can’t have both, but if you’re focused on getting the standing ovation, you take your focus off being a blessing. That’s my viewpoint anyway. One situation that I had proved this all to me. After I finished speaking to a group one time, there was complete silence at first. I thought that I had bombed. People then broke into applause. Afterwards, many people came to me and said that they were so moved by my talk that applause would have changed the energy and they wanted to just sit quietly with it for a moment and think about what I had said. Guy Kawasaki states, entertaining speeches do a better job in delivering information. Get a Standing Ovation – At Work! 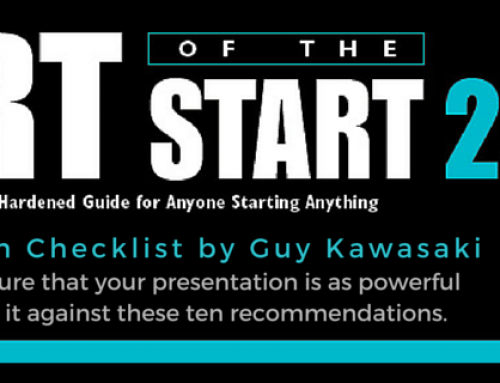 Heres some great advice from ex-Apple Evangelist Guy Kawasaki How to Get a Standing Ovation. Great advice – we referenced it in our post Top ten tips for giving a better presentation. Please, could you spare us the SYSTEMATIC numbering of each of your entries? It makes sense some time, but not MOST of the time. Think of your shopping list. Does it make ANY sense to buy carrots before yoghourt, or chocolate, or shaving cream? I’m finally back in Manila after 4 days of Search Engine Strategies fun in Nanjing, China. SES was everything I imagined it would be…and more. Here’s my China story. I just got three Toastmaster’s “Best Speaker” Awards in a row. Thanks for the advice! Very good article, Guy. I fully agree with almost all of your points. I have a different opinion about the #5 Overdress part, though. If you are really good, people don’t care what you are wearing. I listened to many speeches, where the speaker was dressed totally different from the rest of the audience and nobody cared, because the speaker performed just great – and often also was one the best speakers of the day. The audience may care at the beginning of your speech, but if you are good, they definitely won’t care at the end. A great trainer on public speaking said it like this: If you are not good, wear a tie. Regarding the “I’m smarter/richer/more powerful than you” point you mentioned. If the person giving a speech also feels and acts like that (“I’m better than you, heheh”), it doesn’t really matter if he/she is wearing a suite or just jeans and a t-shirt. He would come across as being arrogant anyway. However, if someone actually is richer, more famous and more powerful, but is giving his speech in a natural way at the same level of the audience, people won’t care what he/she is wearing. I also experienced that when you dress comfortably, your speeches are sometimes also better than when wearing a suite or whatever, just because everybody else does. Comfortable means, something that makes you feeling well when going to a specific event, etc., which could be a suite+tie, too. If you are speaking at the World Economic Forum in Davos, Switzerland, you may feel more comfortable, when wearing a suite. Having been speaking for years, I’m sorry I didn’t fall upon this top ten earlier. Makes a world of difference. In your case you’ve got a habit of not leaving the stage when event organisers want you to. You rebel without a cause you. This only happened once in my career. You had to be there: there was only one session following me; the speaker was from Google, so she was filthy rich; it was early in the afternoon; it was their mistake to only give me 30 minutes; and I felt the mojo. Good stuff, but I’ve got a problem with it. The problem is with the intial concept that getting a standing ovation is a good thing. I’d want to go one step back from that and ask why we’re presenting…. Great advice Guy. Looking forward to your talk at WebmasterWorld Las Vegas! This is great information, as i am about to start (Energy Savings Assn.). If you’re top objective (at the conference which you are speaking) is to promote/sell your company’s products or services then the best way to accomplish this objective is to NOT sell during your presentation. Entertaining the audience and offering free “value” will have them lining up for business cards after your talk while a sales pitch will find you alone at a table set for ten during lunch. Read more about how to effectively leverage conferences to market your company on my blog www.ericglazer.com. As a hypnotherapist the most common phobia I help people with is public speaking. I always say that if you can speak calmly and confidently to one person, then you have all you need to speak to thousands. For my own public speaking, I found I can enjoy the occasion once I learnt to speak slowly and with pauses. I felt more relaxed and the audience were not overwhelmed by the speed of what I wanted to communicate. About “ech ben ein berlina” – gelly dounuts are known in German speaking Europe as “Berliners”. In Berlin though, they are called “pfankuchen” :). Guy Kawasaki ha elaborado otra lista que me pareció interesante. Esta para ayudarnos a elaborar y practicar una presentación que nos permita dar un discurso público memorable, memorable en lo bueno. hi i have a question i am 13 and i ws wondering what things you can do to get people to listen to you like for example one would be like in a famou speech the use the same saying 3 times so that it stays in the audiences head are there anyothers story telling is a good one but any other ones please i need this for my english oral speech. you say “ech ben ein berlina”, which in German means “i am a doungut”. ein berlina was a dougnut at the time, the correct way to say it is “ech ben berlina”. You are correct and you are not. First you can say “Ich bin ein Berliner” and mean “I am from Berlin.” although technically “Ich bin Berliner” would be better. Also, jelly doughnuts are called “Berliner” in most parts of Germany, except in Berlin. It is confusing otherwise. In Berlin, a jelly goughnut is called “Pfannkuchen”, which means something else entirely in the rest of Germany. Thanks for the great article. The most important thing in my opinion is that you make something special, something different than others, especially, when there are more speakers. In the end, not the presentation with the best content, but the presentation which entertained the audience is remembered. Kennedy said, in correct German “Ich bin ein Berliner”, which means “I am from Berlin” or “I am a citizen from Berlin”. Berliner is also a food, but not in that context. I am a recent grad, looking to speak. I talk about the way many people become famous from low-income backgrounds, such as celebs, singers, etc. I counsel people from all walks. I can help anyone with anything. Great insight into the art of public speaking. An excellent advice for anybody. for this post i give you full marks..
i hope all orther commentators will agree to this..
For me this post is very intresting. I don’t know if my saying that you are a great speaker indeed and that i myself at the first place give you a standing ovation, for just any simple words you utter that make a great deal of potentional and wise-versa. I have gotten ahead with alot of blogs, expertised bloggers, those in their predecent lineage of literary quest. It starred from and in all controversial issues that come be far streched, politics, economic, war and thrill, emotions and fatigues and then blogging experiences (ex: How the blogger spent his summer holiday or how it spent him). Blogging history is a long list, of expertise, technical skills and immense talent. It doesn’t take me to just thank you, but bow my head and keep yah that we all owe it to you. I wish to learn that much of a 0.1% and you someday are the adjuciator for my speech giving occassion. Untill then, let’s bound to be guru and student. I agree with every point that you have presented. I believed these points will help everyone struggles in public speaking. Please add that every speaker must not only entertain the audience. He must show that his “big idea” when accepted will benefit the audience. Speaking is about the big idea, the audience, and you.